You may spend days touring and visiting all corners of this Natural Park, discovering moonlike landscapes, lost filming locations, unspoilt coves and beaches of fine sand and crystal clear waters, which have nothing to envy to those of the Carribean. It is truly one of the best places to visit in Europe. This is, without doubt, one of the last bastions of wild European beaches and untouched nature. 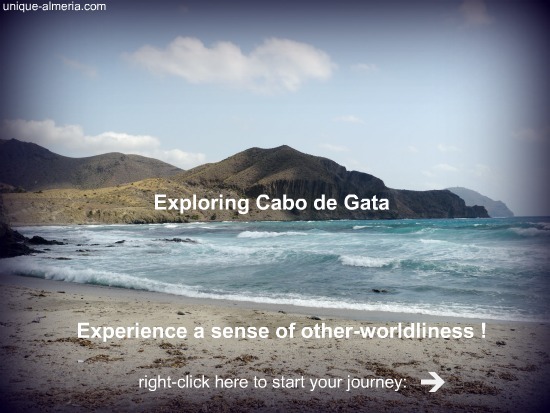 Unrepentant hippies and increasingly foreigners, discover the Natural Park of Cabo de Gata, seeking alternative ways of life. It is indeed a 'different world' which my husband, kids and I need to visit frequently, to recharge batteries, slow down and renew our souls from the busy and stressful life in Barcelona. Playa de los Muertos (The beach of the dead): Its name harks back to an ancient story of ships and shipwrecks. Rather than one of the many European beaches it could be anywhere in the Carribean. The amazing water clarity of turquoise color contrasts with tiny white pebbles. Not in vane it was voted by Spaniards to be the best beach in Spain. Playa de Embarcadero, this is a rocky beach perfect for snorkeling, but not if you are looking for sand, you will hardly find any, but beautiful white rocks (ancient lava ashes) and cristal clear water. Los Escullos Beach , also called "Playa de Arco" a wonderful beach with fine sand, view towards Isleta del Moro. The surroundings are inviting too! Stroll around and discover fossil snales in millions of years old white rocks, that were formed from lava ashes. Cala del Torro , a cove that is ideal for snorkeling, without any sand but many rocks and stones, you will find a wonderful underwater fauna and flora. So if you are looking for a typical sandy beach, skip this one! If you are a snorkeler, this is your cove! El Playazo, simply breathtaking! It boasts fine sand but also huge white rocks formed from lava ashes and fossils. The fortress "San Ramón" hanging from the cliff reminds us that around the year 1520 this coastline was continuously threatened and attacked by pirates. While you are in the region, don't miss to pay a visit to the nearby old Gold mining village and its abandoned mine. An emblematic place that in the past not only suffered from the gold fever, but also attracted well known International Filmmakers. You will find the museum and the botanic garden interesting too. The first one you will see is the ‘Los Genoveses Beach’, where you keep going and going quite a while until the water finally covers you. David Lean, director of the movie ‘Lawrence of Arabia’ (1962) decided to use this beach as the backdrop for the attack on the train scene. Quite close from here, just behind the rocks and dunes, you will be surprised by the Cala Barronal. Cala Barronal a cove to which you will have to walk on foot, passing marvelous sand dunes and pita plants. Fine black lava sand will be awaiting you, along with bizarre lava rocks. A paradise for geology geeks. The next beach following the dirt road from San José is the Monsul Beach. Monsul Beach , with its fine, black sand. Huh! You found another lost filming location! Congratulations. This impressive beach was used by Steven Spielberg as backdrop in Indiana Jones and it is probably the best beach in Spain. Finally, almost at the end of the road, you will arrive at Cala Media Luna. Cala Media Luna, it is a cove, similar to Monsul beach but smaller and with amazing lava rock formations. It also boast fin dark sand, typical for this ancient volcano landscape. On your way back, enjoy strolling around the village San Jose with its beach bars, restaurants, flee markets and night clubs. Apart from the above mentioned, there are many hidden coves in Cabo de Gata Natural Park. Some of them can only be reached on foot like Cala San Pedro, accessible by boat or following a trail along the mountains. Other hidden coves are: Cala de Enmedio, Cala Rajá, Cala del Plomo, Cala Higuera and Cala Carbón.. These long sandy beaches can only be reached, (coming from Almeria city) direction San Miguel de Cabo de Gata, a charming fishing village! This long sandy beach is one of my favorite. Just outside Almeria city, this part already belongs to the Natural Park but is cut off by the Light House. Even in summer (high season) you may find it almost empty! These beaches are located next to the village "San Miguel de Cabo de Gata" stretching from the outskirts of the village until the lighthouse. This area is famous for its Salt pans and is of special interest for Birdwatchers, who will enjoy Flamingos and many other species. Drive along the endless beach up to the lighthouse and the viewpoint of "Las Sirenas" (the Mermaids) from where you will enjoy breathtaking views over the area. The Natural Park of Cabo de Gata offers visitors marvelous European beaches with a volcanic, moon-like environment. The sea-bed is hiding an ecosystem, unique in Europe, consisting in wide meadows of Posidonia, these also act as natural measurements for water quality. In these clear and transparent waters there live sponges, snails, sea stars, urchins, anemones, corals and jellyfishes as well as the halibut, etch and sea bream. A great diversity of flora and fauna marina attract diver enthusiasts from all over Europe. The good news is that there is no need to be a professional diver to enjoy these beautiful sea-beds. We dive and snorkel there frequently. I recommend you a water proofed camera. When visiting these beautiful European beaches, please please bear in mind that you are actually strolling through one of the most fragile ecosystems on Earth which must be protected and conserved by all means! Click on the following image and be amazed! The Natural Park of Cabo de Gata-Níjar is a natural area of a great diversity ranging from the depths of the Sea to Sierras of a volcanic origin, via wetlands and sandy beaches. It encompasses 38,000 ha. inland and 11,624 ha. 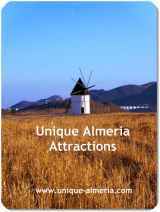 of sea, shared between the municipalities of Almeria, Níjar and Carboneras. In 1997, the park was declared a UNESCO Biosphere Reserve , also obtaining the names of Special Protection Area for Birds (SPA), Ramsar site, Site of Community Interest and, most recently Special Area of Mediterranean Interest (SPAMI). It is also part of the European GEOPARKS. The climate is almost unique in Europe, characterized by its aridity similar to that in North of Africa, being the annual rain fall less than 169 mm. As a result of this climate and the variety of environment, the area harbours an important representation of flora and fauna. Among its main habitats are the Azufaifo scrublands (Ziziphus lotus), Mediterranean xerophytic pastures, salt flats, gypsum flats, and the singular submerged grassland of Poseidonia oceánica (or Neptune Grass).The highlight is the amazing richness and originality of its fragile ecosystem. The most valuable features are its endemic and exclusive species, which nowhere else on earth can be found, such as the 'Dragoncillo del Cabo' (Antirrhinum charidemi), the 'Godolobo del Cabo' (Verbascum charidemi) and the 'Aulaga Mora (Ulex canescens) amongst the flora and the Trumpeter Bullfinch and Alondra de Dupont, amongst the fauna. Enjoy these unique European beaches and its magic surroundings, full of history, stories and secret corners!